We are currently out of stock. Enter your email below to receive a back in stock notice. More stock should arrive on: 4/25/2019. Kölsch is a pale, mildly hopped ale, with a unique soft fruitiness in the finish. Developed in the German city of Cologne, Kölsch has become increasingly popular in Germany in recent years, perhaps due to its unique quality of being an ale with the refreshing lightness of a lager, yet with the more complex, fruity finish of an ale. True German Kölsch is rarely seen bottled in the United States, probably due to German law which states Kólsch can only be brewed in Cologne, and only by one of the 22 licensed Kölsch breweries. Alcohol: 3.8%, IBU's 27. William's Kölsch is an authentic rendering of this famous Cologne beer style, and can be either consumed quickly like an ale, or lagered (stored cold) after bottling for 8 weeks to develop the milder traditional flavor. Includes 6 pounds of blended malt extract, flavoring and aromatic hops, liquid yeast, and corn sugar for carbonation. Makes 5 gallons with a starting gravity of at least 1.039. Ease of Brewing: Beginner. This shows our Kolsch after 3 weeks in the bottle. I have brewed this before a great tasting brew, I was worried about this batch as it seem to really get with it in the fermentation stage, eventually settled down, to normal fermentation, just bottled today so now the wait for at least2 weeks for carbonation and 8 weeks to finish, everything in the kit was great, will  do again..
from Elida Ohio Forget Any Other Kit. I think I tried every other Kolsch kit available, Should have brewed this one first! Right on the money after sitting in bottles in fridge 8 weeks. I was lucky enough to visit Cologne and try the real deal, this kit is a perfect match. Just remember to give it some time to age. from WI Won Reserve Grand Champ at local fair! This is a great beer! I served it at my son's Graduation and it did very well at the local fair. Awesome stuff! This is one of my favorite go-to kits. Goes down easy and everyone who tastes it loves it. 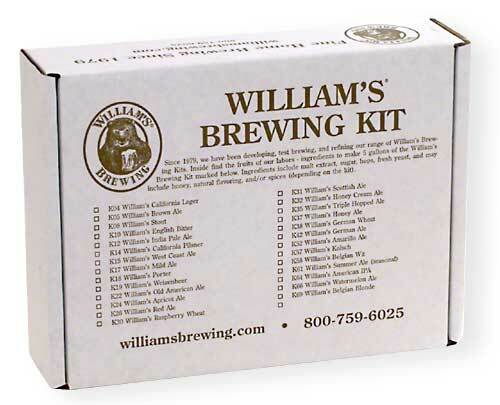 It's the one kit that my wife is always asking "when are you going to make some more Kolsch"! Highly recommended! Great success! I'm happy to serve this to my German guests as an alternative to the fine IPA kits here that my American guests can't get enough of. Simple to make and foolproof instructions give you a great chance at making a delightful Kolsch. If you use a wort chiller, you can't miss.